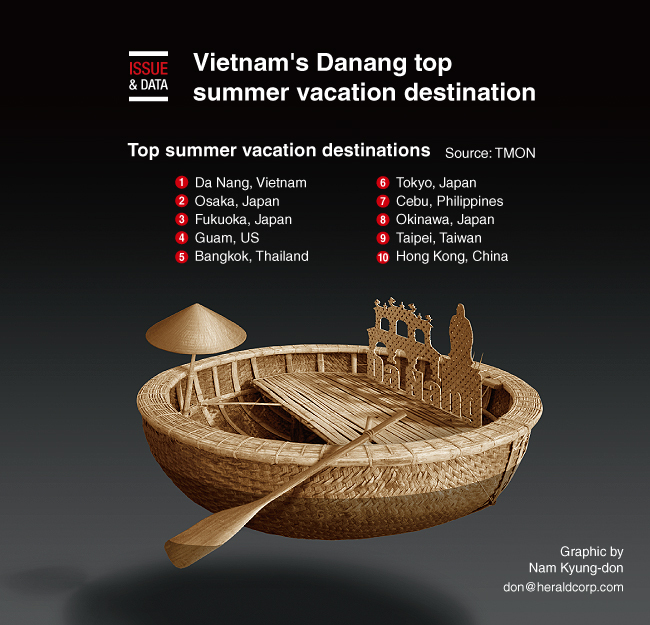 Vietnam's city of Danang was the most popular summer vacation destination among Koreans this year, a shift from last year's preference for cities in Japan, according to an online shopping mall. Flight ticket sales in the July-August period showed Danang as the top foreign travel location, TMON said, up three places from last year. The cost of traveling in the city is relatively cheap at about 100,000 won ($90.33) per day. TMON said its sales data showed a growing preference for places that offer hotels, resorts, shopping and tourism activities altogether. Tickets sold for Guam rose one notch to No. 4, and Cebu, the Philippines, rose two places to No. 7.